Actually, we are leaving in two weeks from yesterday, but I fell asleep exhausted yesterday evening before I could do anything. 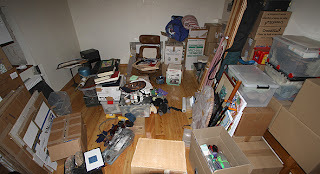 I have been putting a bit of stuff into boxes every afternoon so it can go into storage next Monday. I can't wait to get rid of it, personally, though I think Mike and Antonia may feel differently. We are still trying to find a tenant for our house. We have several nibbles, but no papers signed yet, so we are just hoping for the best. I don't exactly feel excited about our imminent departure, just business like. It's hard work getting everything set up, and I'll be able to feel excited when we do leave.